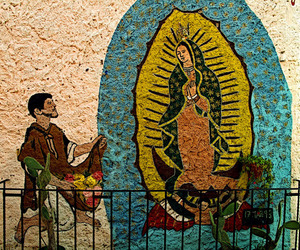 The Virgin of Guadalupe is the tale of humble farmer, Juan Diego, who stumbles upon the Virgin Mary in 1531, shortly after the arrival of the Spanish, near present day Mexico City. Juan Diego informs the local bishop who does not believe him. The following day Mary presents Juan Diego with roses that do not grow in Mexico. 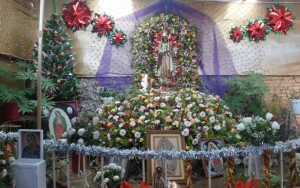 He wraps the roses in his blanket and when presented to the bishop the blanket now displayed the image of the Virgin of Guadalupe, the most significant image of Mary for Mexicans, as Queen of the Americas. This story was originally written in Nahuatl, an indigenous language, in 1649. This ever-popular image of Mary, representing the newly forming country of Mexico, is a complex codex of indigenous symbolism. These symbols were readily understood by the natives and made converting eight million to Catholicism in the following seven years much easier. Prior to Guadalupe’s appearance, the conversion of the indigenous had gone at a snail’s pace with only a handful of Catholic missionaries in Mexico. Her Hands: Her hands are in prayer. The left hand is dark skinned while the right is more light symbolizing the union of two distinct races, the indigenous and the Europeans. Combined with her bent left knee (with the tip of one shoe showing) shows Mary dancing and clapping her hands, which was how the Aztecs prayed. 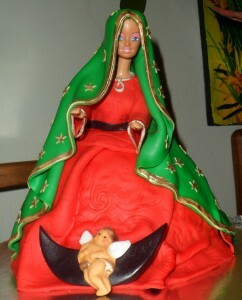 Her Belly: Mary’s hair is loose in the manner single (virgin) Aztec women wore their hair (married women wore braids). In addition, Mary wears a black belt, a noblewoman’s fashion trend for native pregnant women. Mary is symbolically preparing to birth a new race, nation and the start of a new era indicating the time of Jesus. In addition, the proportions of Mary’s body indicate that she is physically ready to give birth in late December. Face: The virgin is dark skinned with a round face in profound prayer reflecting love and tenderness. She appears to be between 18 and 20 years old. Her looking to the side is a symbol of respect and reference as the indigenous considered it improper to look directly into one’s face. Her features are neither native, nor Spanish, indicating a new mixed race. Aura: The Virgin is surrounded by rays of light to tell all she is the mother of light, the sun and the sun’s son. Mary has descended to light the lives of the faithful. Stars: The 46 stars correspond to the positions of the constellations in the heavens in the winter of Mary’s apparition in 1531. For 46 days leading up to December 12th, an image of Our Lady of Guadalupe leaves the church and spends each night in a different home. The 46 days represent each of the 46 stars with each star symbolizing a quality of Mary such as Our Cheerleader, Queen of Hope, Queen of Heaven, Flower of Flowers, etc. Around 6 PM she is paraded to the next home for that evening’s rosary. On the final day Mary returns to the church to start the party. Moon: Mary stands in the middle of a half moon (the Nahuatl word for Mexico translates to “the center of the moon”). 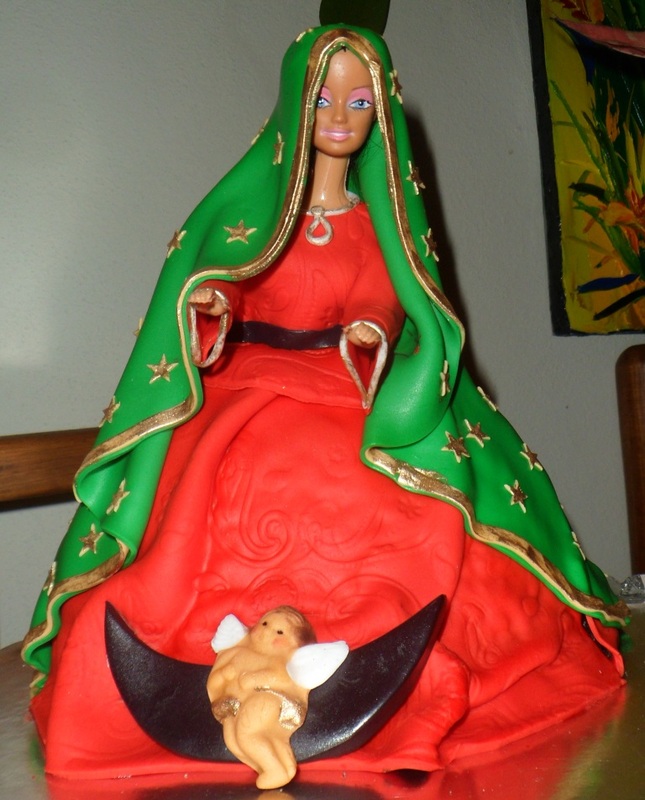 Mary is symbolized as being in the middle of Mexico and on top of the moon (thus being greater than the Aztec’s mood god). Today the moon appears black as liquid silver had once been applied to “enhance” the image. Angel: At the feet of Mary is an angel apparently done flying. His wings are symmetrical, positioned like an eagle’s, later the symbol of Mexico. Clothing: The flower petals in Mary’s dress are the Nahuatl symbol for the presence of God, his plenitude and being the center of space and time with his mother, Mary. The nine types of flowers shown represent the nine major Aztec tribes that surrounded the area that today is Mexico City. The flowers each have four petals symbolizing the four cardinal points (north, south, east and west) and the cycle of the year. It is possible to overlay the map of Mexico on her dress the flowers coincide with all major mountains, rivers and lakes. The color of the dress is crimson symbolizing the dawn of a new nation. The color of her cape, blue-green, is what native gods and royalty wore. It was also the native color for fertility. Brooch: In Nahuatl, the central position of the oval jade brooch (an ancient idol symbol for life) with a cross on it indicates the importance of Christ. The cross, the Spanish sacred symbol blends with the four petaled flowers, the Aztec sacred symbol. Snake or Serpent: There is none as is often seen at the foot of Mary because the snake was the traditional symbol for the native god, Quetzalcoatl, the ruler of heaven and earth. This image of Mary is literally above that. 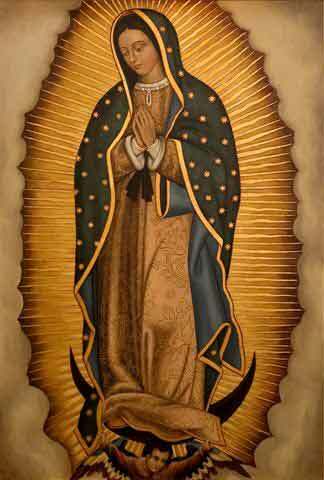 The name, Guadalupe, is a Spanish version of the Nahuatl word, Coātlaxopeuh , meaning “the one who crushes the serpent,” referring to both Quetzalcoatl of native beliefs and the snake from the Garden of Eden of Catholic beliefs. Eyes: Reflected in her eyes is Juan Diego, the bishop and several other people that were present when Juan Diego unrolled his cape and revealed the image for the first time. The tiny size of figures requires today’s technology to be seen. Material: The cape is made from woven agave fibers and normally disintegrates after 20 years. The cape with Guadalupe’s image has survived nearly 500 years, acid spilled on it and a 1920’s bomb that destroyed all else near the image. 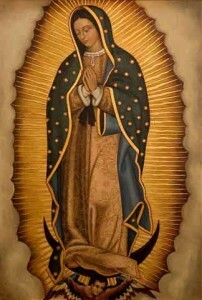 Name: Guadalupe has many meanings in the various indigenous languages spoken at the time including “Woman of the Heavens”, “Wings of Light like the Eagle of Fire”, and “Our Adorable Mother”. Others feel that though she is Mexican, her name is Arabic meaning “River of Wolves”. Location: Mary appears where the native goddess, Tonantzin (or little mother) was worshiped making Guadalupe’s appearance more understandable to the local indigenous. In San Miguel, and all of Mexico, December 12th is grand celebration, particularly if your name is Guadalupe (male or female, Lupe for short). The shrine to Guadalupe outside of Mexico City is the second most visited shrine in the world (the first being the Sistine Chapel in Rome) with 6 million visitors on December 12th alone. The shrine for Guadalupe here in San Miguel is located at Mexiquito, the orphanage for boys featuring day-long celebrations.